High albedo roofs reduce the heat island effect. What was that??? Translation: white reflective roofs help keep both the buildings they are on and the surrounding area cooler in hot weather. A white roof can reduce your air conditioning costs by up to 20% on hot sunny days and normally costs as little as 15% more than a dark roof. So if a white roof saves so much electricity, why would you consider a green one, which costs considerably more? A properly installed green roof will last longer than any other type of roof, because it protects the membrane beneath it from weather extremes. And green roofs help control storm water runoff. Huh??? 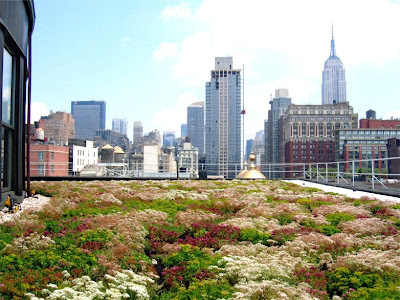 Translation: green roofs absorb rain and reduce the amount of water that flows into the sewers. This is important because New York, like many older cities, has a combined sewage system, and as with as little as 1/4" of rainfall raw sewage overflows into our rivers.